Practice Proper Oral Hygiene: Use a wet, soft-bristled toothbrush to brush your child’s teeth as soon as they erupt. When your child is young, it is important to brush his teeth for him. If you are met with resistance, try positioning your child’s head in your lap, which can help you gain control as well as better visualize all of the teeth. To ensure your child is learning correctly, supervise or help him brush his teeth until the age of 8. Your child’s teeth should be brushed at least twice a day: once in the morning and once at night, right before bedtime. Smear just a little bit of fluoridated toothpaste on your young child’s toothbrush. As soon as your child is old enough to spit out the toothpaste, use a pea-sized amount. As soon as the spaces between the back teeth close (around age three), your child’s teeth should be flossed at least once a day. A Healthy Diet Leads to Healthy Teeth: Oral bacteria, fed by sugars and starches, produces acid that attacks tooth enamel and causes tooth decay; therefore, repeated exposure to sweets and sugary beverages can put your child at high risk for cavities. Plain milk is a better beverage choice during the day, and water is good for both day and night. Healthy snacks include cheese, whole fruit, and yogurt. Protect your Child’s Teeth from Injury: Fitted mouth guards help prevent injuries to the teeth and jaw like fractures and displacements, and are, therefore, highly recommended for children participating in recreational activities and organized sports. Regular Checkups with a Pediatric Dentist are Very Important: The American Academy of Pediatric Dentistry recommends taking your child to the pediatric dentist every six months, starting with the first birthday. Clean the affected tooth and the surrounding area. Rinse the mouth thoroughly with warm water or use dental floss to dislodge any food that may be impacted. If the pain persists, contact the child’s pediatric dentist. Do not take aspirin or apply heat on the gum or on the aching tooth. If the face is swollen, apply cold compresses and contact the child’s pediatric dentist immediately. Apply ice to injured areas to reduce swelling. If there is bleeding, apply firm but gentle pressure with a gauze or cloth. Contact the child’s pediatric dentist. Keep the jaw from moving. Take your child to the nearest hospital emergency room, even for minor head injuries. If possible, find the tooth. Handle it by the crown, not by the root. You may rinse the tooth with water only. DO NOT clean with soap, scrub or handle the tooth unnecessarily. Inspect the tooth for fractures. If it is sound, try to reinsert it in the socket. Have the patient hold the tooth in place by biting on a gauze. 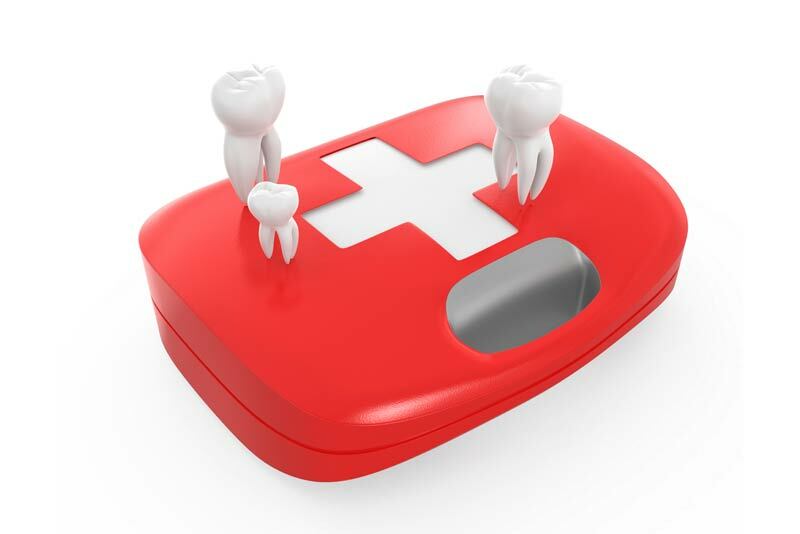 If you cannot reinsert the tooth, transport the tooth in a cup containing the patient’s saliva or milk. If the patient is old enough, the tooth may also be carried in the patient’s mouth (beside the cheek). The patient must see a dentist IMMEDIATELY! “My child has a double row of teeth” is one of the most common emergency calls we receive in our office. Although it may look strange, in reality it is not a dental emergency. Typically, a permanent tooth that is erupting pushes against the root of the baby tooth and slowly dissolves, or resorbs, it. The baby tooth looses anchorage, becomes mobile, and eventually falls out. Tooth fairy time!!!! The permanent tooth then continues to push up and assume its place in the jaw bone. However, sometimes when a permanent tooth is erupting, it can bypass the root of the baby tooth. As a result, it may take a different path and come in right behind the baby teeth. This is called ectopic eruption and a typical place for this to happen is with the lower front, or anterior, teeth. Most of the time, this ectopic eruption will resolve on its own, without intervention by a dentist. Eventually, the baby teeth will fall out and the tongue will push the permanent teeth forward into proper position. Recommendations: We advise parents or caregivers to assess the mobility of the baby teeth. If a tooth is loose and it is not causing any discomfort, we recommend that the child wiggle the tooth on a daily basis. Given this assistance, the tooth should fall out in couple of weeks. If the tooth is solid (no mobility) and it has not loosened up for a few weeks, or if it is a source of discomfort then we would recommend making an appointment to evaluate the situation and to decide if extraction of the baby tooth is necessary.